Roberto Olivan premieres 'Cuculand Souvenir' at festival Sismògraf - R.O.P.A. Last 20th April, festival Sismògraf of Olot hosted the premiere of Cuculand Souvenir, the new large-scale performance by the artistic director and choreographer Roberto Olivan. Several international artists have participated in this new production. Olivan brings his performing arts company R.O.P.A. – Roberto Olivan Performing Arts back to the stage with Cuculand Souvenir. This performance is a large-scale production where contemporary dance and circus merge with technology to explore the impact of technological progress in our daily lives. It is a thought-provoking performance that invites us to think about how we have gone from using technology to live it, how we plan the future as we build the past and how it seems the past has become a superficial ‘souvenir’ of a perfect non-existent time that help us get away from our reality. 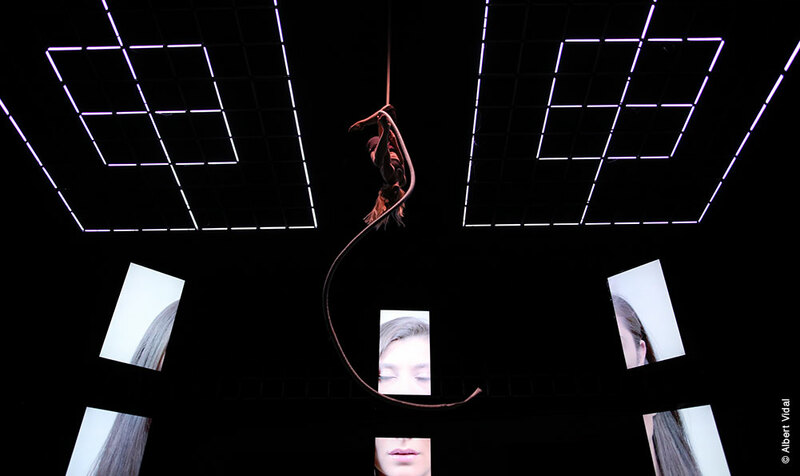 The work is the result of a creative research process involving the electroacoustic music of the sound sculptor Laurent Delforge; the scenography lighting of Romain Tardy, who is one of the most important visual artists on the current digital scene; and dancers and circus artists: Manuel Tiger/Héctor Plaza “Buba”, Delia Ceruti, Luis García “Fruta”, Dunya Narli, Chey Jurado, Akira Yoshida, Tina Afiyan Breiova. The performance will be touring during 2018 in such outstanding stages as Teatre Nacional de Catalunya (TNC), where it will be on stage in November. Moreover, it will be touring Teatre Municipal de Girona, Teatro Principal Zaragoza, Teatre Auditori de Granollers, Teatre Principal de Vilanova i la Geltrú, Sala Concha Velasco de Valladolid, Grec Festival of Barcelona, among others. Cuculand Souvenir is a co-production between festival Sismògraf, Grec 2018 Festival of Barcelona, ICEC – Ministry of Culture of the Government of Catalonia, Teatre Nacional de Catalunya and Kalamata International Dance Festival. It also has the support of Xarxa Transversal, Fundación Municipal de Cultura de Valladolid/Teatro Lava, ATRIUM Viladecans and Solidança. Sismògraf has been a unique setting to show this new large-scale performance since this festival is a meeting point for cultural managers, producers, managers, festival directors, artists, distributors, critics and many other professionals linked to the world of dance. In fact, in this new edition, 170 international and national professionals have participated at Sismògraf, what proves its role as a meeting place for the dance field.